It took multiple trial and error sessions to learn how to turn that glob of pizza dough into a nice round, flat circle. At first, the dough was temperamental and not at all cooperative (at least from my perspective). I'd tug and pull and it would just break apart. Frustrating. Golden Rule #1 - Let the dough get to room temperature. Now I'm no scientist, but there is something behind the elasticity of the dough that makes it harder to stretch if it's cold. So, let your dough sit for about 30 minutes before you start playing with it. Golden Rule #2 - Flour is your friend. Take some bread flour or all-purpose flour to powder your surface before stretching out the dough. Flour your table, your dough, your hands; be liberal. Golden Rule #3 - When all else fails, grab for the Olive Oil. I was in the kitchen and my dough kept tearing. 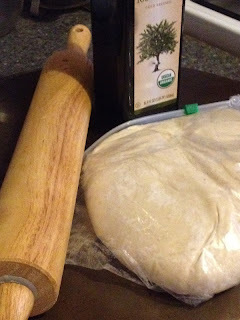 My head steaming, frowned face livid, I was about to reach for the number for delivery when I heard a friend's voice in my head (the same friend that ingeniously introduced me to the pizza stone), and desperately reached for the olive oil. Phew - Dinner saved! Apply just a touch of Olive Oil to a rolling pin, then just roll her out. Rotate the dough every once in a while, and viola, it is the perfect circle. Lastly, once your dough is all rolled out, take a fork and give it a couple of pokes (careful not to poke through the dough, just lightly stab at the top). This allows the dough to breath and will discourage those pop-up bubbles from forming. Finally, I am at peace with my method. Sure, there's still no romantic tossing in the air (maybe one day), but for now, it makes for a collaborative effort for me and the dough to get to that perfect circle with my hair, and sanity, still intact. Final tip of the day: When I cook a homemade pizza, whatever the toppings may be, I usually place the dough in the pre-heated 450 degree oven for 8-10 minutes to cook on its own. Take it out, add the toppers (sauce, cheese, etc. ), and cook for another 8-10 minutes until the cheese browns. This ensures that the dough itself is completely cooked through and crispy. Nothing is more disappointing than a gorgeous looking pie that isn't edible in the middle.